US spy planes captured this photo of the Wonderpets during a routine training mission. Washington D.C. A warrant has been issued from the United States government for the arrest of the Wonderpets on charges of vigilantism, animal endangerment, and kidnapping. U.S. citizens are divided over the warrant, some believing the Wonderpets to be criminals, while others seeing them as public benefactors. "The Wonderpets themselves are responsible for the endangered animals they supposedly rescue by creating a state of learned helplessness. Neurotic, impressionable young animals who haven't learned to fend for themselves are increasingly allowing themselves to become stuck and trapped, knowing full well that the Wonderpets will come to save them. By allowing the Wonderpets to continue their brand of vigilante rescues, they aren't only putting the children they rescue in danger by not having trained professionals do it, they're in fact encouraging neurotic animals into acting codependantly." Dr. Wolpier cited a few cases where enthusiastic would-be heroes were inspired to join the Wonderpets, only to put themselves in serious jeopardy. A fanatic attempting to copy the Wonderpets' actions. "Wanting to fly like the Wonderpets," said Wolpier, "A bee and a slug got in the Flyboat, only to accidentally start flying it and almost crash, and let's not forget about all the Ollies of the world." Ollie, a rabbit who sometimes joins the Wonderpets on their missions, often attempts to copy their actions. He has endangered himself on multiple occasions, and one time was actually sprayed by a skunk. Ollie's mother has threatened litigation. "Yeah, I smelled for a while," said Ollie, "But it was worth it. 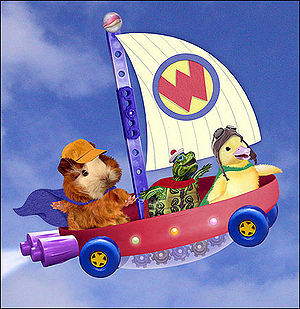 The Wonderpets are awesome, although not as awesome as me. Ollie, Ollie, Ollie to the rescue!" Yes, Ming-Ming. This IS sewious. "Children in my classes these days are increasingly mispronouncing their R's as W's. Is this the great nation that our founders intended? A place where children cannot even pronounce letters correctly? I assert that this is not what they intended. It makes my job harder when I have to tell parents day after day that I've had no success in teaching children how to use their R's correctly because of some false hero who incorrectly teaches them. I say, the Wonderpets must be brought to justice." Those who support the Wonderpets say that they have saved the lives of countless animals and that people are merely throwing blame where it doesn't belong. 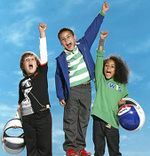 Children the nation over are perhaps the most vocal supporters of the Wonderpets, claiming them to be "fun", "cool", and "awesome". Children protest the Wonderpets warrant while holding the helmets for their own self-made Flyboats. I like the Wonderpets, said Billy Torter, age 5. They're real fun and they teach me good things like helping animals and eating celery. Those mean old government people shouldn't hurt them or put them in prison. The Wonderpets are nice. Prison is where bad people go." Children aren't the only people who support the work of the vigilantes. "It is ludicrous to think of the Wonderpets as anything other than heroes. "said Langa Lane, pro Wonderpets activist. "Today's young animals need saving from time to time, and it's the Wonderpets who are there for them. If parents don't want their young being rescued by the Wonderpets, they should watch their children more closely so they don't get lost, or endangered in the first place. How often is it that the parents only come back for their children after they've been rescued? How neglectful are these parents? They should be thankful they have the Wonderpets to save their children time and again!" When asked how she could support behavior that is so blatantly illegal, Lane had no comment.